HMGA1, p53, and HIPK2 coexpression activates proapoptotic genes. 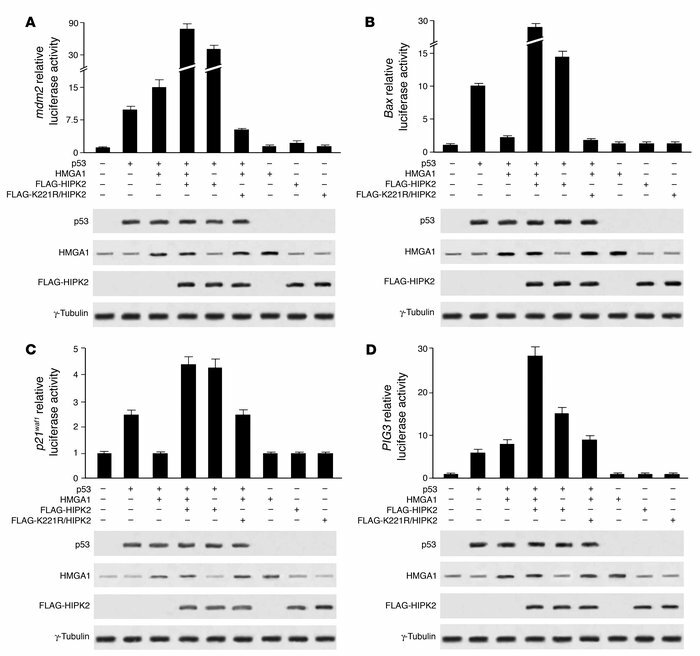 Effect of FLAG-tagged WT HIPK2 or the kinase-defective HIPK2 mutant (FLAG-K221R/HIPK2) on the activity exerted by HMGA1 on reporter vectors mdm2 (A), bax (B), p21waf1 (C), and PIG3 (D). p53-null H1299 cells were used as recipient. The pCMV-p53 vector encoding WT p53 protein was transfected alone or with the indicated plasmids. All transfections were performed in duplicate; data are mean ± SD of 5 independent experiments. Empty vectors were used as a control. Western blot analyses of p53, HMGA1, and FLAG-HIPK2 proteins expression from 1 indicative experiment are shown in the lower panels.